An instrument is used to measure the level of air tightness the house maintains, diagnose any air leakage problems, estimate natural infiltration rates, and gauge efficiency losses due to home air leakage. 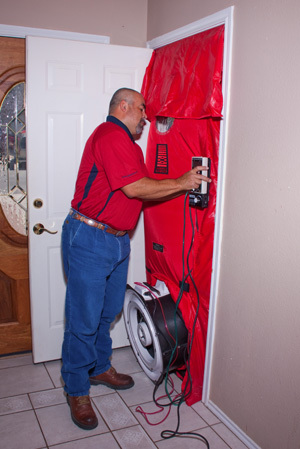 The Blower Door/Envelope Test is used to measure the amount of air a home may be leaking through exterior doors and windows, resulting in wasted energy and higher utility bills. The Blower Door/Envelope Test diagnoses and measures air leakage, estimates natural infiltration rates and efficiency losses, and certifies construction integrity. 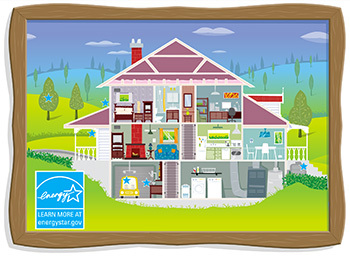 Having this test will ultimately ensure a home’s air efficiency and save the owner money. This test is the top choice for utility programs, energy raters, HVAC contractors, builders, insulation contractors, and weatherization professionals. The Blower Door/Envelope Test is performed with all of the home’s doors and windows closed. An expandable frame fits the door opening, with a light fabric cover to block off the doorway, except for the fan. Then pressure gauges are used to take measurements. With this test we are looking to measure how much air a home leaks at a specified reference pressure. When the recommended repairs are made, the result is tremendous energy and financial savings. LgO will measure the level of air tightness a home maintains to identify possible leaks. Our inspection results are provided to the customer, and recommendations on how to correct any problems are made. Repairs are then made by a contractor of the customer’s choice. At the customer’s request, LgO will make a follow-up inspection to ensure the repairs are within the energy efficiency recommendations.